A bike without a rider is like Coke without Jim Beam…it’s just not right! Is life getting you down? Do you feel that you haven’t had any motivation to ride or do anything other than work and go to sleep. If you have, don’t fret! I’m sure there are some guys and gals out there that can relate. Heck man I’ve been there. I’ve often called it being in a funk. Some of my funks have lasted for months and others it lasted a few minutes. From personal experience, I think this occurs when I start taking mountain biking for granted. It’s easy for me to forget or not see the benefits of an activity if I am not doing it. For example, working out and eating right. How many of us sit around thinking about wanting to drop weight or eat better? I’m sure most of us do, but what lacks is the motivation to execute. All the benefits of it is easily forgotten because we don’t remember how great we felt when we were working out 3 days a week and eating good quality food. In the present stage, you and I think it would be far more difficult to get started. 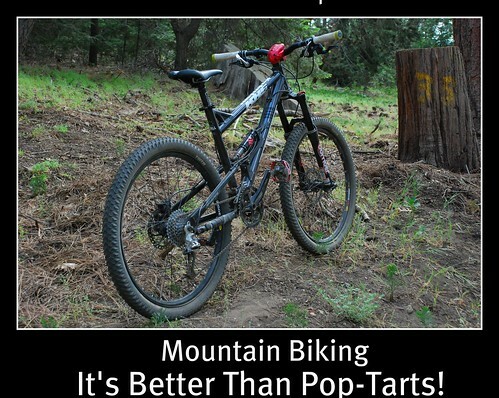 Well that’s how it is in mountain biking. If you’ve been out of the saddle for a while. The best remedy for that is to get on your bike. It doesn’t matter how out of shape you are, the point is, you NEED to get out there. I’m sure you’ve read all the benefits that exercise has on a person’s brain. Stuff about endorphins and other scientific stuff like that get released and makes the activity pleasurable. Besides, mountain biking is just an awesome way to get rid of the stresses you’ve accumulated through out the day. Here’s something else you gotta think about. Do you remember that time when you had to convince the Mrs. that you NEEDED that expensive bicycle. She couldn’t understand that the bike you had wasn’t right for the type of riding you were going to start doing? After months and months of negotiations, your wife finally gave you the Ok to get that nice bike you’ve been wanting. Well, if you’re not riding your bike, she’ll see you on the couch, and the bike in the garage. Then she’ll come to the conclusion that the purchase was a waste of money…and guess what…she’ll be nagging you! Oh man, just think about the constant nagging and jabs she’ll take at you just because you are not riding your bike. I don’t know about you, but that’s enough motivation for me to make sure I’m on that bike as often as I can. But then again, Priscilla isn’t a nag at all. Nope. She’s awesome in every way. In closing, Ride your bike, it will help your sanity. Don’t ride your bike, then your wife will nag you. Nuff Said! Next PostNext They picked up what I was putting down.